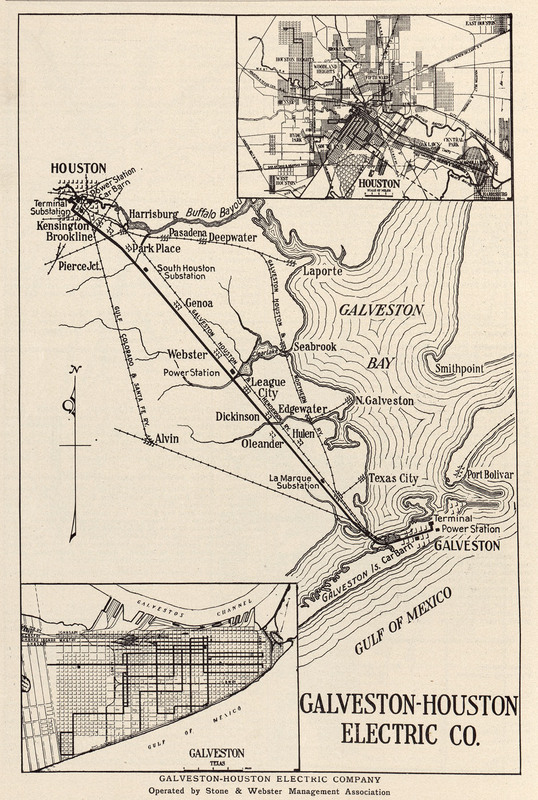 Galveston-Houston Rail Map. Courtesy of the University of Texas at Austin. Image available on the Internet and included in accordance with Title 17 U.S.C. Section 107. Sherman-Dallas Interurban Railway. Image available on the Internet and included in accordance with Title 17 U.S.C. Section 107. Texas Electric Railway Company's Interurban Electric Rail Car. Image available on the Internet and included in accordance with Title 17 U.S.C. Section 107. ELECTRIC INTERURBAN RAILWAYS. The electric interurban industry in Texas totaled nearly 500 miles, the second largest interurban mileage among the states west of the Mississippi River. Most of this mileage was in place by 1913, as the industry grew rapidly during the early 1900s to fill the need for frequent passenger service between urban centers that could not be met by existing steam-railroad service. About 70 percent of the mileage was in the Dallas-Fort Worth area, where electric lines connected Fort Worth and Cleburne, Fort Worth and Dallas, and Denison, Dallas, Corsicana, and Waco. Another 20 percent was in the Houston-Galveston and Beaumont-Port Arthur areas. The rest was scattered around the state. The decline in mileage was also swift, however, as the growth of improved highways and widespread private car ownership combined to siphon off most of the interurban ridership. By the end of 1941 only two lines, the Texas Electric and the Houston North Shore, a subsidiary of the Missouri Pacific, remained; they were both discontinued in 1948. In 1901 the first interurban to be constructed in Texas, the Denison and Sherman Railway, ran ten miles between Denison and Sherman. The second, in 1902, was the Northern Texas Traction Company, which ran thirty-five miles between Dallas and Fort Worth. Operations ceased in 1934. The Belton-Temple Traction Company opened its thirteen miles between Belton and Temple in 1904. The company was reorganized in 1918 and the name changed to Southwestern Traction Company. Service terminated in 1926. The Texas Traction Company constructed a sixty-five-mile line from Dallas to Sherman in 1908. The company purchased the Denison and Sherman Railway in 1911. In 1912 the J. F. Strickland interests, which controlled the Texas Traction Company, purchased the twenty-eight-mile line built by the Dallas Southern Traction Company from Dallas to Waxahachie and named it the Southern Traction Company. In 1913 that railway was built on to Waco, and a fifty-six-mile line from Dallas to Corsicana was completed. In 1917 the Texas Traction Company and the Southern Traction Company merged to form the Texas Electric Railway Company, the largest interurban railway in the South, with more than 200 miles of track. The Dallas-Corsicana branch was discontinued in 1941 and the Dallas-Waco and Dallas-Denison branches in 1948. Railcar In front of Grand Central Depot in Houston. Image available on the Internet and included in accordance with Title 17 U.S.C. Section 107. Northern Texas Electric Company Rail Map. Courtesy of the University of Texas at Austin. Image available on the Internet and included in accordance with Title 17 U.S.C. Section 107. Union Pacific Railyard in Englewood, outside Houston. Image available on the Internet and included in accordance with Title 17 U.S.C. Section 107. Smaller systems operated around Texas. The Texas Interurban Railway Company had two lines, a twenty-nine-mile run between Dallas and Terrell from 1923 to 1932 and a thirty-eight-mile run from Dallas to Denton from 1924 to 1932. The Bryan and College Interurban Railway Company ran seven miles between Bryan and College Station. It began with gasoline-powered cars in 1910 and switched to electricity in 1915. In 1923 it was sold three times; after the third sale, to citizens in Bryan and College Station, it was operated as the Bryan-College Traction Company until 1930. The Galveston-Houston Electric Railway Company ran fifty miles between Galveston and Houston from 1911 to 1936. During 1925 and 1926 it won first place in the nation in an interurban speed contest. 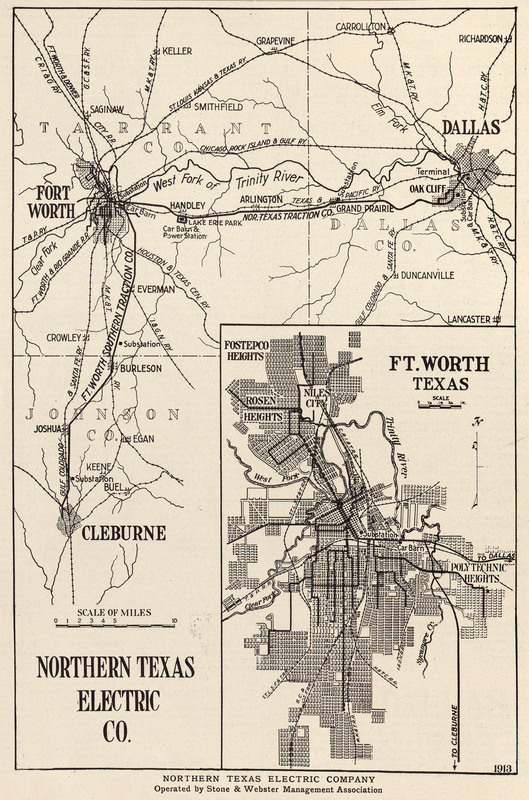 The Fort Worth Southern Traction Company opened thirty miles of track between Fort Worth and Cleburne in 1912. This company was reorganized in 1914 as the Tarrant County Traction Company, which was subsequently acquired by the Northern Texas Electric Company. The latter became the Northern Texas Traction Company, which closed the line in 1931. The Rio Grande Valley Traction Company ran twelve miles between El Paso and Ysleta from 1913 to 1925, when electric service between the Ascarate stop and Ysleta was replaced by bus service; electric service between El Paso and Ascarate was discontinued in early 1926. The Jefferson County Traction Company (subsequently the Eastern Texas Electric Company) ran twenty miles from Beaumont to Port Arthur from 1913 to 1932. The Roby and Northern Railroad, which began in 1915 and ran four miles between Roby and North Roby, was electrified in 1923 and operated until 1941. The last interurban railway to be built in the United States, the Houston North Shore Railway Company, built twenty-six miles from Houston through Baytown to Goose Creek in 1927. It operated until 1948. The line, no longer electric, is now an important industrial branch of the Union Pacific between Houston and Baytown and is virtually the only vestige of the Texas interurban network that remains. Margaret M. Gilson, A History of the Texas Electric Railway, 1917–1955 (M.A. thesis, North Texas State University, 1972). H. Roger Grant, "`Interurbans Are the Wave of the Future': Electric Railway Promotion in Texas," Southwestern Historical Quarterly 84 (July 1980). George W. Hilton and John F. Due, The Electric Interurban Railways in America (Stanford University Press, 1960). William D. Middleton, The Interurban Era (Milwaukee: Kalmbach, 1961). William D. Middleton, Traction Classics: The Interurbans (3 vols., San Marino, California: Golden West, 1983–85). Johnnie J. Myers, Texas Electric Railway, ed. LeRoy O. King (Chicago: Central Electric Railfans' Association, 1982). Rod Varney, Texas Electric Album, Texas Electric Railway (Glendale, California: Interurbans, 1975). Herb Woods, Galveston-Houston Electric Railway (Los Angeles: Electric Railway Publications, 1959). Andrew D. Young and Eugene F. Provenz, The History of the St. Louis Car Company "Quality Shops" (Berkeley: Howell-North, 1978). Handbook of Texas Online, Robert A. Rieder, "ELECTRIC INTERURBAN RAILWAYS," accessed April 25, 2019, http://www.tshaonline.org/handbook/online/articles/eqe12. Uploaded on June 12, 2010. Modified on February 7, 2017. Published by the Texas State Historical Association.